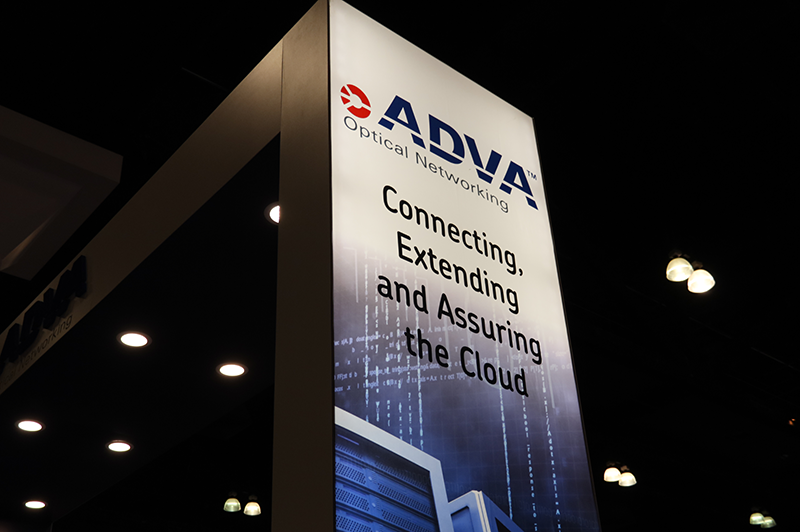 ADVA demonstrated 100 Gbps quantum-safe optical communication over a long-haul network -- a world-first -- in conjunction with leading European national research and education networks (NRENs). The trial link stretched 2,800km between Poznań, Poland, and Trondheim, Norway, and covered multi-operator optical transport in three separate research and education networks. Broadnet, GÉANT, NORDUnet, PSNC and UNINETT were all instrumental partners in the joint demo. ADVA said the demonstration highlights how high-speed, secure connectivity with robust protection even against large-scale quantum computer attacks is possible over deployed operational infrastructure. "What we’ve accomplished here is of enormous significance to any organization transporting large volumes of sensitive and valuable data. Alongside our NREN partners, we’re proving how quantum-safe site-to-site connectivity can be achieved using our FSP 3000 optical transport technology with ConnectGuard AES encryption and a post-quantum key exchange algorithm. And by showcasing the solution in a very realistic scenario, we’re underlining how network operators can offer long-term security to their customers right now," said Jörg-Peter Elbers, SVP, advanced technology, ADVA. "The appeal of post-quantum cryptography compared to quantum key distribution is that it offers a straightforward, seamless transition from current key exchange protocols. As a digital method, it is independent on the physical layer, making it easily deployable also over long-haul and multi-operator links. Both methods can, of course, be used in combination providing an even higher level of security." Kaiam is releasing an enhanced series of 100G “CWDM4+” transceivers. Kaiam said its enhanced transceivers offer substantially higher performance than the CWDM4 standard. Specifically, the enhanced CWDM4+ transceivers provide -1dBm minimum Tx OMA, 3dB more than required by the CWDM4 standard. This, in turn, supports 3dB more link budget than the CWDM4 standard requires, supporting more robust links in the face of various real-world data center link impairments. Kaim also noted that it is able to exceed MSA specifications without additional cost. 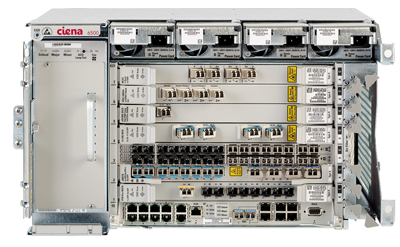 Ixia, a division of Keysight Technologies, announced first shipment of a 400GE test system with multi-rate 200/100/50GE speed options for the K400 400GE QSFP-DD load module family. These multi-rate speed options allow network equipment manufacturers to test products at speeds based on the new IEEE 802.3cd draft standard and IEEE 802.3bs standard using the 400GE QSFP-DD module at 200GE, 100GE, and 50GE speeds, from a single port. 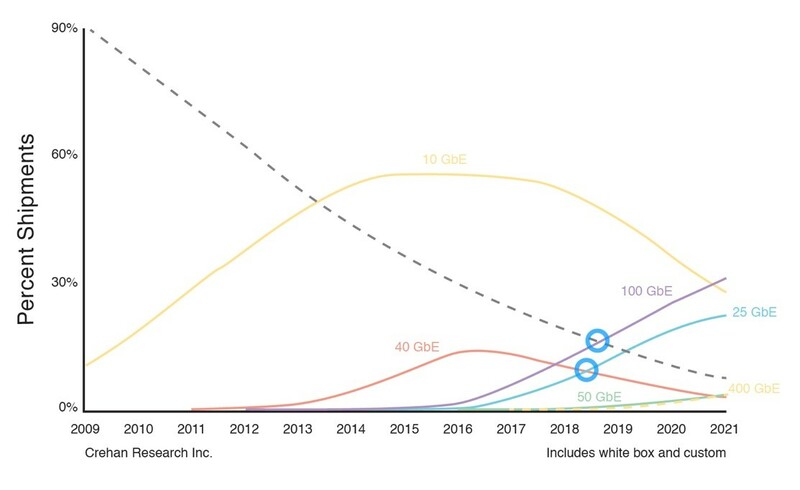 Ixia said 56 Gbps technology is at the forefront of Ethernet speed evolution—moving from legacy 25GE, 50GE, and 100GE (based on 28Gbs technology) to the new 200GE, 100GE, and 50GE interfaces expected to come to market this year. The Ixia K400 QSFP-DD load module is the only shipping test solution that can validate these technologies using 400GE-port fan-out media for testing 400GE, 200GE, 100GE, or 50GE multi-speed or single-speed network devices. Gigalight, which is based in Shenzhen, introduced two 40km single receiver optical modules for Deep Packet Inspection (DPI) applications. a single receiver 100G QSFP28 ER4 Lite optical module with a power dissipation less than 2.5W. This module uses a high-sensitivity APD detector (ROSA) with a receiving sensitivity up to -15dBm per channel (1E-12, @25G). This module increases the optical transmission budget for users and meets the optical transmission applications (optical fiber directly connected without splitting) up to 40km when the Forward Error Correction (FEC) function in the front of the system side is enabled. a single receiver 100G CFP2 ER4 optical module with a power dissipation less than 3.5W. It uses the PIN photodetector (ROSA) and the miniaturized Semiconductor Optical Amplifier (SOA). At the same time, it adopts the SOA closed-loop adaptive gain control algorithm developed by Gigalight, which can quickly lock the working current of SOA and quickly adjust the amplification performance of SOA, to ensure that the receiver's acceptance sensitivity is as high as -21.4dBm per channel (1E-12, @25G). Gigalight said the optical interface of the front-end, DPI flow collection and distributary equipment needs to be upgraded from 10GE to 100GE ports. When the flow collection equipment cannot be placed in the same room as the analytics and storage, a long distance fiber transmission is needed. 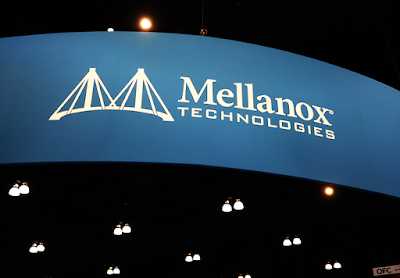 Mellanox Technologies announced a big milestone: volume shipments of LinkX optical transceivers, Active Optical Cables (AOCs) and Direct Attach Copper Cables (DACs), have surpassed the one million 100Gb/s QSFP28 ports milestone. Verizon is currently carrying customer traffic on part of its transport network using a new highly scalable circuit emulation solution from Cisco that supports speeds up to OC-192. Previous circuit emulation equipment carried speeds up to OC-12. Circuit emulation enables transport of conventional digital and optical signal rates over a packet-based MPLS network without impacting customer traffic -- creating a smooth migration of legacy services to next-generation infrastructure and improving overall reliability. As part of its next-generation 100G U.S. metro network rollout, Verizon initially deployed this technology where it could aggregate multiple Ethernet and TDM circuits at the same location onto a unified high-speed circuit. “This is a true architectural collaboration with Verizon. 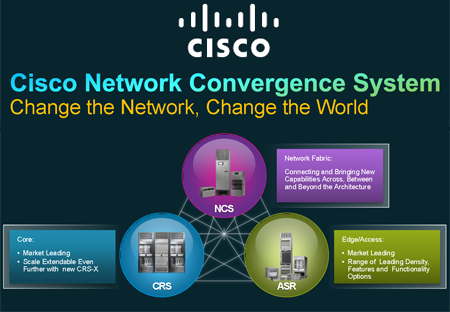 We have worked hard to deliver this unique solution that will easily enable the growth of Ethernet services while improving the reliability of mission critical TDM private line services,” said Bill Gartner, vice president, optical systems and optics, Service Provider Business, Cisco. 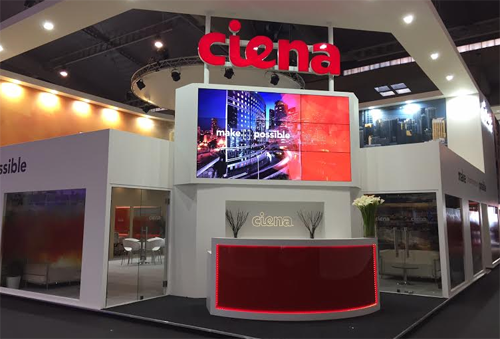 Verizon has selected Ciena and Cisco as vendors for its next generation metro optical network. Specifically, Verizon will test and deploy Ciena’s metro-optimized 6500 packet optical technology and the Cisco Network Convergence System on portions of its 100G metro network this year, with plans to turn up live traffic in 2016. 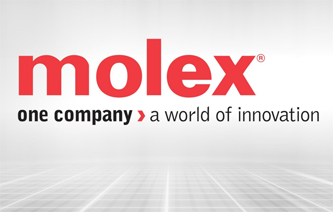 Supplier volumes will be guided by ongoing testing, support and performance. The University of Guam is now connected to the global Research and Education Network fabric at 100G. The GOREX network—or Guam Open Research & Education eXchange—connects Guam to Hawaii and California via the new SEA-U.S. fibre-optic submarine cable. The Marine Laboratory and the Water Environmental Research Institute at the university are two of the academic groups expected to benefit the most from GOREX at the onset, although UOG president Robert Underwood believes the true impact to the island community is in the opportunity for data access, exchange, and analysis in other fields such as healthcare, economics, and the social sciences. Norrsken, a Sweden-based regional operator, is the first to deploy the Infinera XTM II and the recently released 400G Flexponder. The carrier operates a regional network in Sweden providing Layer 1 wavelength division multiplexing (WDM) services and Layer 2 Ethernet services. The equipment will be used for new 100 Gb/s services to leading internet service providers and carriers. 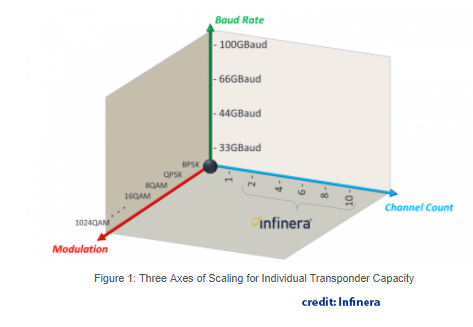 Infinera said its XTM II platform and 400G Flexponder enable network operators like Norrsken to activate multiple 200 Gb/s wavelengths on a fiber, providing up to an eightfold density increase and a reduction in power per gigabit of 3.5 times over the previous generation of 100 Gb/s technology. In June, Infinera introduced its next generation packet-optical platform for metro networks. The XTM II, which delivers Layer 0, Layer 1 and Layer 2 services, is optimized for bandwidth-intensive cloud scale applications at the metro edge, such as Remote PHY, 5G transport and data center interconnect (DCI). The new platform builds on Infinera's XTM Series, but now adds 200 gigabits per second (200G) per wavelength capabilities, with an eightfold density increase and a reduction in power per gigabit of 3.5 times. Power consumption is believed to be the lowest in the industry for 100/200G transport. It also features Infinera Instant Bandwidth, which is the company's open grid line system with SDN control. This gives network operators a highly flexible, open and software-programmable packet-optical solution for Layer 0, Layer 1 and Layer 2 services. A new portfolio of XTM II upgraded chassis for improved power management and cooling and increased density to support nodes that require large volumes of new traffic units. A unified solution providing end-to-end software control from core to access. The XTM Series, including the XTM II, is supported by Infinera’s Xceed Software Suite and DNA network management system. This new range of packet-optical platforms provides network operators with leading low power and high density at Layer 0, Layer 1 and Layer 2, and supports full interworking with the large installed base of XTM Series and the DTN-X platforms. ZTE has been awarded a 100G WDM Backbone Network Project and metro area network (MAN) construction contract with Idea Cellular, the third largest mobile operator in India with 189 million subscribers. ZTE’s optical transport key product, ZXONE 9700, obtained 95% market share in the MAN project. The ZXONE 9700 is an OTN device with ultra-large cross-connect capacity. 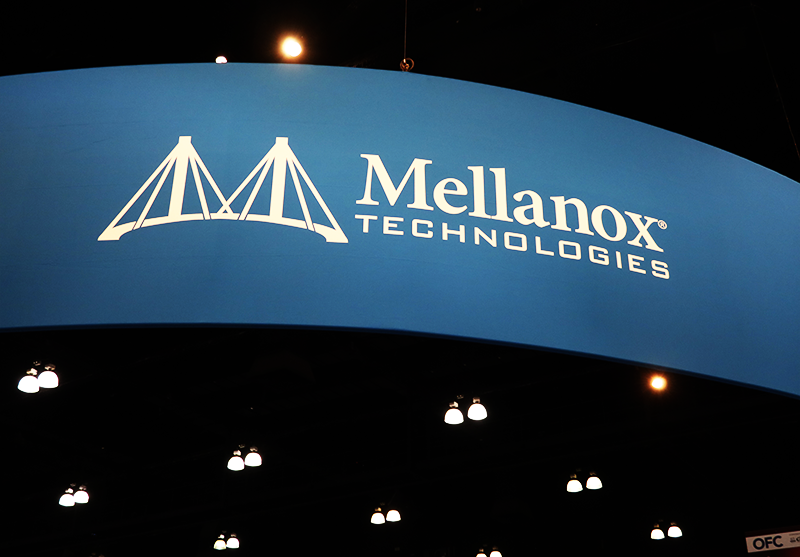 It supports up to 64T cross-connect capacity and 100G/beyond 100G rates for long-haul transmission. pushing optical transmission to 100 gigabaud (GBaud) - this compares with typically deployed baud rates of 32 GBaud with the quadrature phase shift keying modulation carrying 4 bits per baud. Industry opto-electronics are moving to 66 GBaud development demonstrations. Infinera has surpassed this by being the first to showcase 100 GBaud using 32QAM to achieve a single-wavelength 1 terabit per second (Tb/s) data rate using multi-channel indium phosphide-based photonic integrated circuits (PICs) integrated with electronic driver and amplifier application-specific integrated circuits. This result was presented at the 2017 European Conference on Optical Communications (ECOC). pushing modulation technology to 1024QAM (quadrature amplitude modulation) -- at ECOC, Infinera showcased the higher-order modulation scheme of 1024QAM using advanced constellation shaping algorithms and Nyquist subcarriers, allowing wavelengths to be spaced close to each other to maximize the data rate for a certain reach. The Infinera test bed used 66 GBaud at 1024QAM to reach 1.32 Tb/s, yielding spectral efficiency of 9.35 bits per second per hertz over 400 kilometers (km), an industry first. The milestones are significant because they increase they enable the delivery of the highest possible capacity on a single wavelength for varied distances. Optical transmission capacity is also a function of channel count, where multiple parallel wavelengths are combined on a single module to create a coherent super-channel. Infinera noted that as baud rates increase, placing optical components closer together on an integrated chip reduces component size and power while increasing reliability. Its PIC technology uniquely enables high-channel-count coherent super-channels. The 100Gbps Ethernet transport network is here, and the use cases for transport at 100Gbps are multiplying. The previous leap in network bandwidths was from 10Gbps to 40Gbps, and 40Gbps networks are prevalent today. However, while 40Gbps networks are meeting bandwidth and performance requirements in many enterprises, the “need for speed” to handle data growth in the enterprise simply cannot be tamed. As companies continue to grow in scale, and as their data needs become more complex, 100Gbps (“100G”) offers the bandwidth and efficiency they desperately need. In addition, 100G better utilizes existing fiber installations and increases density, which significantly improves overall data center efficiency. A pattern of growth in networks is emerging, and it seems to reflect the hypergrowth increases in data on corporate networks just over the last five years. In fact, the now-famous Gilder’s Law states that backbone bandwidth on a single cable is now a thousand times greater than the average monthly traffic exchanged across the entire global communications infrastructure five years ago. A look at the numbers tells the story well. IDC says that 10G Ethernet switches are set to lose share, while 100G switches are set to double. Crehan Research (see Figure 1) says that 100G port shipments will pass 40G shipments in 2017, and will pass 10G shipments in 2021. Not only is this a lot of data (0.96 petabytes is about 1,000 terabytes, equivalent to 125 8TB desktop hard drives), but as of this writing (Aug 2017), a high-capacity network performance solution from a leading vendor can store approximately 300 terabytes, or only eight hours of network data from one highly utilized link. 100G in the Network – What is a Burst, and What is Its Impact? Traffic from two (or more) sources to one destination. This scenario is sometimes considered uncommon due to the low utilization of the source traffic, although this impression is the result of lack of accuracy in measurements, as we’ll see when we look at the amount of data in a one-millisecond burst. Throughput maximizations. Many common operating system optimizations to reduce the overhead of disk operations or NIC offloading of interrupts will cause trains of packets to occur on the wire. YouTube/Netflix ON/OFF buffer loading. Common to these two applications but frequently used with other video streaming applications is buffer loading from 64KB to 2MB – once again, this ON/OFF transmission of traffic inherently gives rise to bursty behavior in the network. The amount of data in a one-millisecond spike of data is greater than the total amount of (shared) memory resources available in a standard switch. This means that a single one-millisecond spike can cause packet drops in the network. For protocols such as TCP, the data will be retransmitted; however, the exponential backoff mechanisms will result in degraded performance. For UDP packets, the lost packets will translate to choppy voice or video, or gaps in market data feeds for algorithm trading platforms. In both cases, since the packet drops cannot be predicted in advance because the spikes and bursts will go undetected without millisecond monitoring resolution, the result will be intermittent behavior that is difficult to troubleshoot. The typical network monitoring stack is described in Figure 2. At the bottom is the infrastructure – the switches, routers and firewalls that make up the network. Next, in the blue layer are TAPs and SPAN ports – TAPs are widely deployed due to their low cost, and most infrastructure devices provide some number of SPAN ports. The traffic from these TAPs and SPANs is then taken to an aggregation device (or matrix switch or “packet broker”) – at this point, a high number of links, typically 96 10G, are taken to a small number of tool ports, usually four 10G ports (a standard high-performance configuration). At the top are the network tools – these tools take the network traffic fed to them from the aggregation layer and provide the graphs, analytics and drilldowns that form dashboards/visualization. Let’s now evaluate how this typical monitoring stack scales in high-speed environments. · Infrastructure: As evidenced by the transition to 100G, the infrastructure layer appears to be scaling well. · TAP/SPAN: TAPs are readily available and match the speeds found in the infrastructure layer. SPANs can be oversubscribed or alter timing, leading to loss of visibility and inaccurate assumptions about production traffic behavior. · Aggregation: The aggregation layer is where the scaling issues become problematic. As in the previous example, if 48 links are monitored by four 10G tool ports, the ratio of “traffic in” to monitoring capability is 96:4 (96 is the result of 48 links in two directions) or, reducing, an oversubscription ratio of 24:1. Packet drops due to oversubscription mean that network traffic is not reaching the tools – there are many links or large volumes of traffic that are not being monitored. · Tools: The tools layer is dependent on data acquisition and data storage, which translates to the dual technical hurdles of capturing all the data at the NIC as well as writing this data to disk for analysis. Continuing the example, at 96x10G to 4x10G at 10G, the percentage of traffic measured (assuming fully utilized links) is 4x10G/96x10G, or 4.2%. As the network increases to 100G (but the performance of monitoring tools does not), the percentage of traffic monitored drops further to 4x10G/96x100G, or 0.42%. It is difficult to provide actionable insights into network behavior when only 0.42% of network traffic is monitored, especially during levels of high activity or security attacks. Monitoring Must Be Always-On. Always-on network performance monitoring means being able to see all of the traffic and being able to perform drill-downs to packets of interest on the network without the delay incurred in activating and connecting a network tool only after an issue has been reported (which leads to reactive customer support rather than the proactive awareness necessary to address issues before customers are affected). Always-on KPIs at high resolution provide a constant stream of information for efficient network operations. Monitoring Must Inspect All Packets. To be comprehensive, NPM must inspect every packet and every bit at all speeds—and without being affected by high traffic rates or minimum-sized packets. NPM solutions that drop packets (or only monitor 0.24% of the packets) as data rates increase do not provide the accuracy, by definition, to understand network behavior when accuracy is most needed – when the network is about to fail due to high load or a security attack. High Resolution is Critical. Resolution down to 1ms was not mandatory in the days when 10Gbps networks prevailed. But there’s no alternative today: 1ms resolution is required for detecting problems such as transients, bursts and spikes at 100Gbps. Convergence of Security and Performance Monitoring (NOC/SOC Integration). Security teams and network performance teams are often looking for the same data, with the goal of interpreting it based on their area of focus. Spikes and microbursts might represent a capacity issue for performance engineers but may be early signs of probing by an attacker to a security engineer. Growing response time may reflect server loads to a performance engineer or may indicate a reflection attack to the infosec team. Providing the tools to allow correlation of these events, given the same data, is essential to efficient security and performance engineering applications. Finisar has demonstrated the first 100G QSFP28 eSWDM4 transceiver with extended reach for multimode fiber (MMF), which could enable data centre operators to upgrade from 10G to 100G without installing additional fiber. 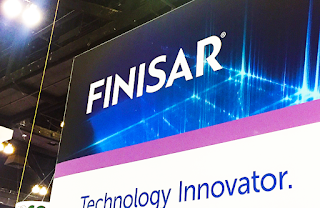 The new device, which is a new member of Finisar's suite of extended reach QSFP28 form factor modules, leverages Finisar's SWDM4 technology and enables 200, 300 and 400 meter links at 100G data rates over OM3, OM4, and OM5 duplex MMF, respectively. Finisar now claims the longest fiber reach among duplex MMF solutions in the industry for 100G QSFP28 Ethernet applications. In a demo at this week's ECOC 2017 in Sweden, Finisar is showing the new QSFP28 eSWDM4 module transmitting live data over 300 meters of OM4 multimode fiber connected to a receiving QSFP28 eSWDM4 module. A third ECOC demonstration features a 100G QSFP28 ER4f transceiver supporting 40km 4WDM applications. This transceiver is the newest member of the Finisar suite of extended reach QSFP28 modules. The ER4f module enables 40 km links at 100G data rates over duplex single mode fiber (SMF) with FEC on the host, or 30 km links with duplex SMF without FEC. A new generation of single wavelength 100G trancseivers is a step closer. Whereas currently deployed 100G optical transceivers rely on 4x25G WDM technology, the next generation of transceivers will use higher order modulation techniques, such as PAM4, and higher data rate operation at 53Gbaud. This means that that one laser and one receiver could do the job that currently requires four lasers and four receivers. In addition to 100G-DR/FR/LR, Source Photonics plans to leverage this technology for 400G-DR4/FR4. At this week's ECOC 2017 in Sweden, Source Photonics will be hosting a private demonstration of its internally packaged TOSA and ROSA sub-assemblies in an optical loopback configuration through 20km of single-mode fiber using a single 100G channel of Credo’s low power PAM4 IC technology. 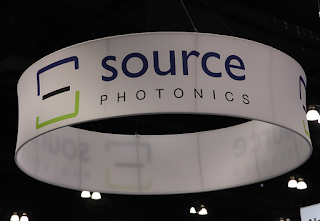 Source Photonics said its testing revealed that the bit-error-rate (BER) after 20km of fiber remains better than the KP4 FEC requirement and was around 5x10-5. The TOSA is based on Source Photonics’ EML laser technology which provides the necessary bandwidth to achieve a TDECQ value below 2.5dB. The room temperature link budget of 10dB provides considerable margin for the most significant link specifications under development in the industry, allowing production margin for performance variations. MACOM Technology Solutions introduced a 100G Single Lambda Solution for cloud data center deployments. MACOM’s 100G Single Lambda Solution leverages the company’s 53 Gbaud PAM-4 technology to deliver 100G throughput over a single wavelength, an approach that has been endorsed by the IEEE that can dramatically reduce the number and cost of optical components typically housed in an optical transceiver module. The 100G single lambda is implemented in QSFP optical modules enabling plug and play compatibility with existing systems. Spirent Communications, a supplier of network test and measurement solutions, announced that it supported New H3C in conducting what is believed to be the highest density 100 Gbit/s data centre switch test. Spirent also announced it had partnered with the China Mobile Research Institute (CMRI) to demonstrate automated testing of virtual core networks. The test, completed by Spirent and the New H3C Group and moderated by independent test lab Network Test, demonstrated the line-rate forwarding capacity and hyper-scale IP route announcement capacity of the H3C S12500X-AF chassis loaded with 100 Gbit/s ports and achieving a density of 768 x 100G ports per chassis. The S12500X-AF switch can support 48 x 100 Gbit/s QSFP28 pluggable optical modules per slot. The test involved Spirent TestCenter and the N11U chassis, representing Spirent's flagship network performance test solution, equipped with the high density dX3 12-port 100 Gbit/s test modules designed to verify next-generation data centre architectures and routers. For the testing, Spirent TestCenter generated 100 Gbit/s line-rate transaction traffic of various frame lengths and provided packet loss, latency, jitter, frame sequence, code errors and FCS error analytics to reflect the quality of transmission in real time. The Spirent dX3 quint-speed test module can support twelve 100 or 40 Gbit/s ports per slot, 25 x 50 Gbit/s ports, or 48 x 25/10 Gbit/s ports per slot. It also supports key interface features such as FEC, auto-negotiation and Link Training. The module can be used to verify data plane QoS for hyper-dense network devices at line-rate, and for testing complex routing, data centre and access protocols on switches and routers. Separately Spirent announced a collaboration with the China Mobile Research Institute (CMRI) to demonstrate automated testing of virtual core networks at Mobile World Congress (MWC) Shanghai. Spirent noted that the demonstration is part of a joint effort to develop a methodology for automated testing of the functionality and performance of the China Mobile TIC (Telecom Infrastructure Cloud). The partners plans to incorporate the test methodology into an automated testing system developed by CMRI to speed testing of services in operational virtual core networks and to form part of the complete vEPC environment developed by CMRI. At MWC, Spirent has provided the test engines for the demonstration, including the virtualised mobile core network emulation and performance testing tool, Landslide Virtual, and the automated testing platform, iTest. The solutions automate performance and functionality tests used to develop, spin-up and monitor the vEPC. In addition, devops models have been developed for the test methodologies, allowing tests to be automated and incorporated into the virtualised network. 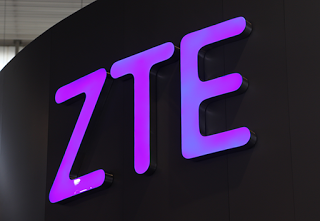 ZTE announced that it has won the bid for three networks as part of True's beyond-100 Gbit/s backbone WDM network project in Thailand, representing an approximately 75% share of the project. The new backbone transmission networks is designed to enable True to support functions such as ultra-high capacity OTN cross-connection, intelligent scheduling of optical networks and ultra-long-distance transmission. The project will also help True to address future service development and further develop its network in the future. ZTE noted that the DWDM network will enable 100/400 Gbit/s backbone transmission speeds and will significantly improve True's network capacity and support service growth across its 3G/LTE, fixed and broadband networks. For the project, ZTE is deploying its 100 Gbit/s and beyond-100 Gbit/s WASON solution featuring advanced PM-QPSK/PM-16QAM modulation and coherent reception technology. The solution also includes its digital signal processing (DSP) algorithm and third-generation soft decision forward error correction (SD-FEC) to enable transmission without the need for electronic relays across the network, thereby reducing the cost. ZTE noted that the software-defined optical networking (SDON) technology is designed to make optical network transmission more intelligent and speed service deployment time, as well as enhancing the efficiency of network scheduling. In addition, the solution features embedded OTDR technology that allows real-time monitoring of the fibre and fault points of the existing network to enhance network maintenance and troubleshooting. The project also includes colourless directionless contationless flexgrid ROADM (CDCF ROADM) functionality, designed to address True's requirements for transparent transmission, flexible scheduling, aggregation, management and monitoring of data services.